Sea grasses are flowering aquatic plants that grow in marine environments. They rely on sunlight for photosynthesis and grow in shallow, protected coastal areas where sufficient sunlight reaches the bottom. Similar to terrestrial grasses, sea grasses are often green and grow in large fields or beds. Sea grass beds are highly productive marine environments that provide shelter and food for a wide variety marine animals. Star grass (Halophila engelmannii) is a smaller sea grass with elongated, elliptical grass blades extending just over 1 inch in height. Star grass is found in the coastal waters off Florida and the Bahamas and grows in sheltered areas with muddy substrates, up to 300 feet in depth. 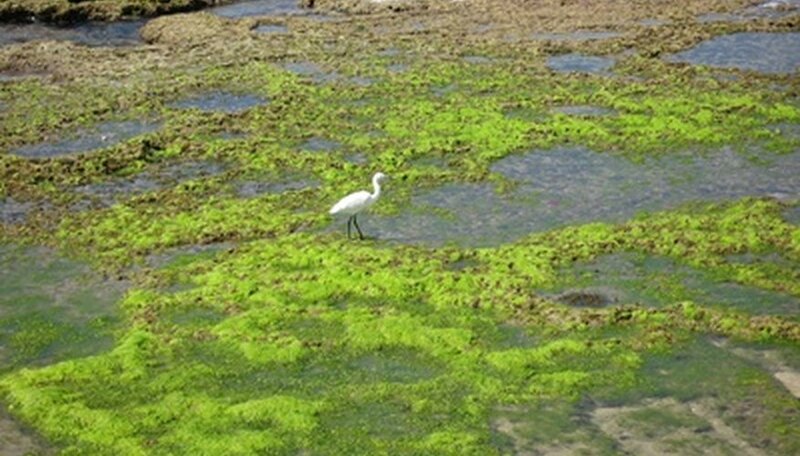 Eel grass (Zostera marina) is found in highly saline conditions on both coasts of the United States. Long ribbon shaped leaves extend 4 feet in height from centralized nodes, on muddy, exposed substrate surfaces. Eel grass is similar in appearance to its freshwater cousin, Wild Celery grass. Manatee grass (Syringodium filiforme) has thin, cylindrical blades that form dense colonies with extensive root systems. Manatee grass grows in shallow, subtidal coastal areas, in the tropical waters of the western Atlantic ocean. Shoal grass (Halodule beaudettei) resembles land grass with flat, stiff blades extending up to 13 inches in height. Shoal grass is found in the temperate, subtropical and tropical waters of the western Atlantic ocean at shallow depths up to 40 feet. Widgeon grass (Ruppia maritima) has narrow, multi-branching blades that are broader at the base, extending 4 inches in height. Widgeon grass is saline tolerant and found in shallow, protected, estuaries and bays, in temperate and topical climates around the world. Turtle grass (Thalassia testudinum) has thick, flat blades that extend 4 to 30 inches tall with an extensive root system that anchors to the substrate. Turtle grass is common in the topical waters of the western Atlantic ocean, growing in the tidal zone to depths of 30 feet or more. Paddle grass (Halophila decipens) is a smaller sea grass species with oval blades extending 2 inches high. Paddle grass is found in coastal tropical and subtropical climates throughout the world and is typically located between 30 to 100 feet deep. Wild celery grass (Vallisneria Americana) has long, ribbon-like blades extending approximately 5 feet in height and 1/3 inch in width. This seagrass species is found in freshwater lakes and ponds in the central plains. With a low tolerance for saline water conditions, wild celery grass is rarely found in brackish water conditions.